The Slim Book Go is a lightweight case with a reverse kickstand that can be adjusted to the ideal viewing angle. The main case also incorporates a built-in holder for the Apple Pencil, allowing it to be stowed away when not in use. 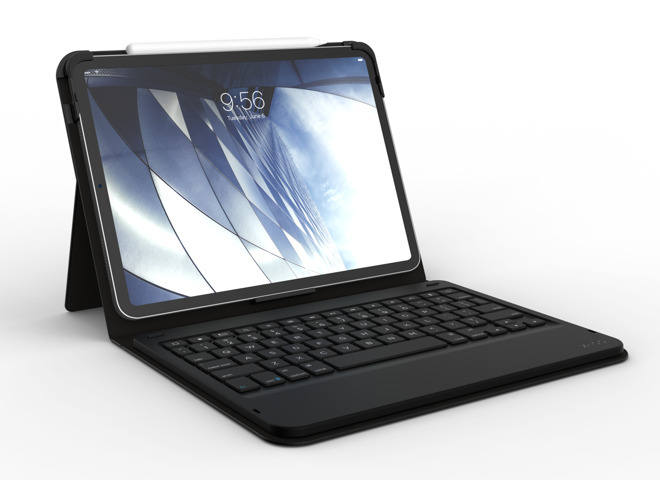 The detachable keyboard can be paired to two devices and toggled between them at will, making it handy for switching between separate work and play environments on separate tablets. Offering notebook-style keys, the keyboard is also backlit, with seven colors available to choose from. 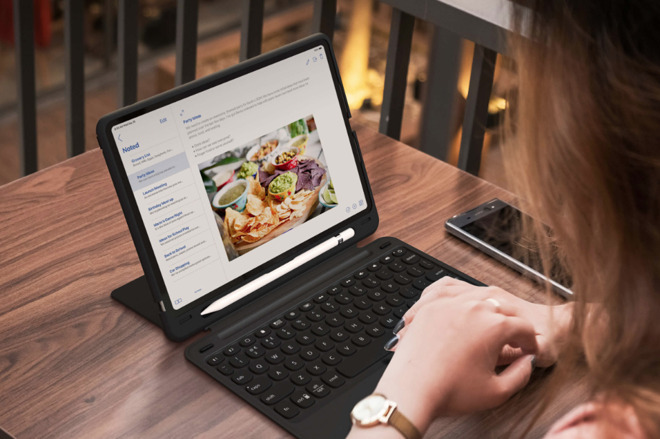 The Zagg Slim Book Go is available now for the 9.7-inch iPad for $99.99, while versions for the 11-inch and 12.9-inch iPad Pro will ship in the spring for $99.99 and $129.99 respectively. The Rugged Book Go offers the same features as the Slim Book Go line, but with considerably more protection. Made with a TPU-wrapped case, it is capable of withstanding drops from up to 6.6 feet, giving some peace of mind from potentially expensive sudden impacts. Arriving this spring for the 11-inch iPad Pro, the Zagg Rugged Book Pro will cost $149.99. The Messenger Folio is another lightweight case, again for the 11-inch iPad Pro, with a stylish fabric cover. A tab is also included for storing the Apple Pencil with the case, while also keeping it easily available for when inspiration strikes. The keyboard, offering notebook-style backlit keys for a comfortable and natural typing experience, is able to last for up to three months between charges of its rechargable battery. When not in use, the keyboard is able to be secured away via a built-in magnetic lock enclosure. Shipping February, the Zagg Messenger Folio for the 11-inch iPad Pro will cost $69.99. So, what do these things weigh? My 12.9 case, for the 2018 model, adds 10 oz to the total. That’s really a lot . You can easily feel that weight. Without it, the ipad seems light, with it, it seems heavy. The 12.9-inch iPad Pro Wi-Fi models weigh 631 g (1 lb 6.3 oz) the matching Smart Folio weighs 240g (8.5 oz), an extra 38%. 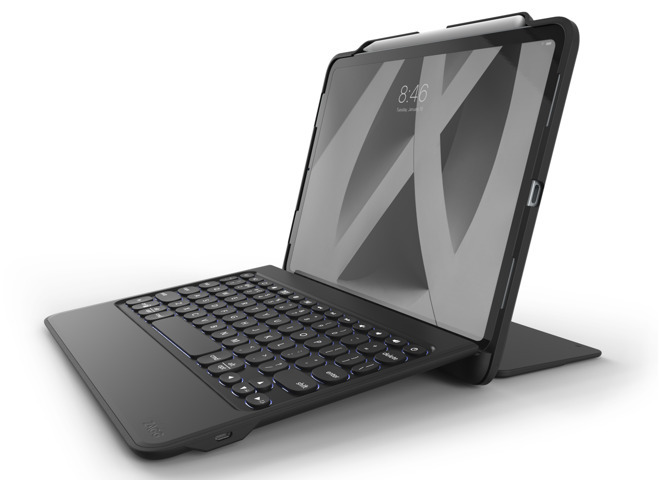 Cannot find the weight for the matching Smart Keyboard Folio - does anyone have one and a good set of scales? Also, cannot find the weights for the Zagg products above. AI, please ask them and then update the review. The 13.3 inch MacBook Air weighs 1.25 kg (2 lb 12.1 oz), which is 98% heavier than the 12.9-inch iPad Pro sans case and 44% heavier if it is protected by the case. I'm planning on buying a 12.9-inch iPad Pro (Wi-Fi only, if you have an IPhone why pay for +cellular? ), but no keyboard. I'm planning on working with it using 90%+ handwriting recognition. If it doesn't deliver what I want then I'll go back to MacBook Pro or Air.